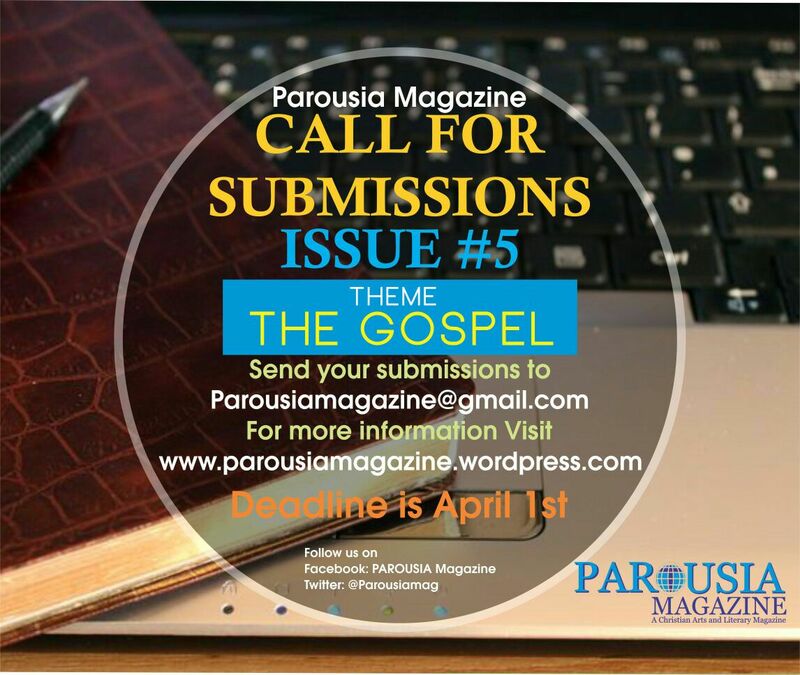 PAROUSIA Magazine is calling for submissions for The Gospel Issue #5 to be published by April 2017 during the Easter Celebration. This issue welcomes narratives on the Death, Burial, Resurrection and Ascension unto Glorification of Jesus Christ which as seen from the scriptures (1 Corinthians 15:1-4) is what the gospel is about also it welcomes submissions that are standard for Christian publications. We are interested in Fiction, Creative Non Fiction, Poetry, Review, Interview, Photography, Painting, Drawing, Graphic and other creative art works. Submission is open to every writer regardless of age, experience or location. Poetry: Send up to 3 poems per submission of any length and style. Fiction: Send 200-1000 words for Flash Fiction and 1000-3000 words for Short Fiction. Creative Non-Fiction and Essays: Send up to 3000 words of your Articles,Essays and Narrative Non-Fiction.